FARGO--I’ve been fortunate enough to grow up in Fargo during a time of growth and cultural development. One thing I’ve been holding out for while watching Fargo boom is diversification of food culture. Okay, to be honest, I’m talking vegan friendly food culture. My parents and I have been riding vegan and vegetarian diets for as long as I can remember. Luckily for us, many restaurants downtown have finally started coming up with more vegan and vegetarian options. These last few months I’ve been trying to focus on learning how to cook and avoid eating out excessively as all these new options appear around me. Unfortunately for me and my desire to avoid eating out, Wurst Bier Hall has recently introduced an entirely vegan menu to their restaurant. I was very reluctant to go try it at first, seeing as I didn’t want to get hooked, but eventually became overwhelmingly curious. I’ve been obsessed with the idea of making vegan bratwursts at home ever since. Wurst Bier Hall has a fun environment throughout the day. When I went to try out the new menu for lunch with some friends, the place was full of families, young people, older people, the whole range. It was fun to see that the food itself of Wurst Bier Hall seems to be just as important to people as the beverages. The vegan menu was an entirely separate menu, something I found to be inclusive and special. I ordered the apple vegan bratwurst. Let me warn you, Wurst’s food can have a bit of a kick to it—my dish was loaded up with jalapeños. Other than a golden, flakey bun and some basic toppings, my food seemed very simple. The flavor of the vegan bratwurst, however, was far from simple. It tasted like fall and warmth and had a very hearty core to it. Don’t worry, I also had my meat-eating friends give it a test to see how it stood up compared to their real brats. Both of them also enjoyed my meal and found the vegan version to have a unique flavor and consistency that leveled with their own. Let’s not forget about the fries. Wurst’s sweet potato fries are crispy and rich and prove an excellent sidekick to their meals. Curious about how a vegan bratwurst is even made in the first place? Typically, vegans and vegetarians use three main substitutions when creating meaty meals: tofu, tempeh, and seitan. Tofu is the spongiest and usually very moist. It holds a lot of a flavor but isn’t incredibly hearty or dense. Tempeh is the densest of the three and has an uneven texture. However, it has more protein than tofu in most cases. Seitan is the middle child, denser than tofu but smoother than tempeh. It’s essentially “wheat meat” and is made by separating gluten from flour. The best thing about seitan is that it can closely replicate a number of meat dishes and goes well with lots of different flavors and seasonings. Vegan bratwursts are usually a form of seitan mixed with traditional bratwurst seasonings. If you’re feeling adventurous, there are a number of seitan recipes that you can find in vegan cookbooks or online. 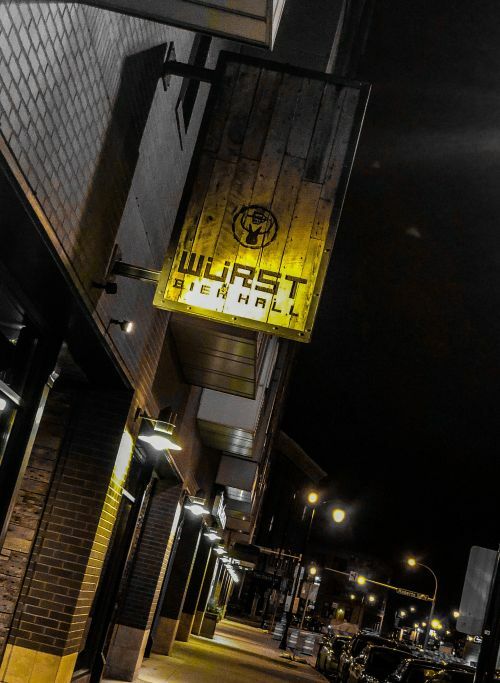 But first, try a vegan bratwurst at Wurst Bier Hall. Their vegan menu is a lot of fun. ​Local food stories- What do they mean to you?